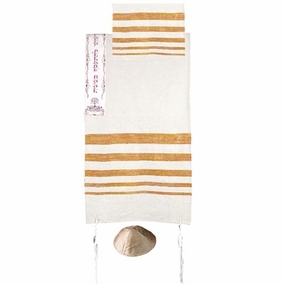 Hand Woven Raw Silk Tallit with Embroidered Atara CAT# TSW- 5. Sizes of talletot vary greatly. hand – woven, including the colored stripes. The Blessing in the Atara is embroidered. It says: “Asher Kidishanu Bemitzvotav Vizivanu Lehitatef batzizit”. Sizes: 55” X 71”. The silk and synthetic ones vary in size, for men, from about 36 ª 54 inches (91 ª 137 cm) to 72 ª 96 inches (183 ª 244 cm). The woolen tallit is proportionately larger (sometimes reaching to the ankle), conforming to the Halakha that the tallit should be large enough to be full-body apparel and not just scarf-like. A ribbon, or a band artistically woven with silver or gold threads (called "spania"), and about 24 inches (61 cm) long by 2 to 6 inches (5 to 15 cm) wide, may be sewn on the side of the tallit that is nearest to the head, and is called the atarah.